I recently took a trip to the Los Angeles/ Anaheim area with my family for a vacation. 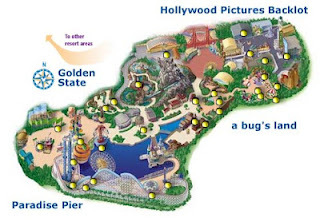 Our main goal was to see The Original Disneyland in California and also visit Disney's California Adventure - a theme park that opened in 2002 and was recently totally revamped, remodeled, and expanded in the summer of 2011. I had been to Disneyland in California in 1995. That year, The Indiana Jones Adventure Ride had opened. I remembered this as one of the best rides I had ever been on at a theme park. Getting to ride it again was something I was interested in ~ comparing the experience from age 21 to age 37. Our first full day in Anaheim (Saturday, December 24, 2011) we went to Disneyland. I had read that going to Disneyland during the Christmas holiday was a good time to go because attendance wasn't so bad that you couldn't walk. I'm not so sure that was the case this year. Maybe the fact that Disneyland and The California Adventure had been revamped made attendance higher. We didn't have a problem with too long of lines and we got to ride most everything in both parks. Understanding how the Fast Pass program works though is key to budgeting your time. While your party waits in line for one ride, one person should go to a nearby ride to get a Fast Pass. In a nutshell … you take your park admission ticket, place it in a machine, and get a time to return to a ride where you can go through a near instant "ride line". The Fast Pass ticketing system is completely free. I enjoy making fun of the rides as an adult and actually understanding the mechanics of how many of the rides work. I enjoy appreciating the artistry of the "Imagineering team" that built the rides. If I could make a recommendation, try to stay in one park an entire day. I wouldn't recommend doing the park hopping ticket. If you don't see everything - you have a reason to come back. If you have time left over … explore downtown Disney. I suggest you make Disney's California Adventure your last park to visit on your last day of your Disney visit because most activities end at around dusk - to prepare for the World Of Color show (which is an absolute must see) . 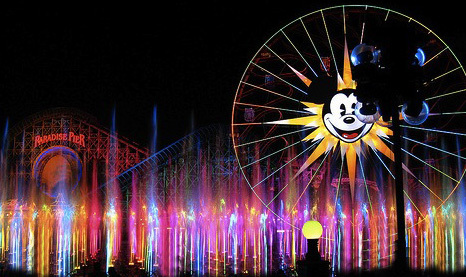 Disneyland California and Disney's California Adventure are very walkable and enjoyable. Eventhough you see people walking everywhere - you feel like you can eat directly off of all the walkways and not get a single speck of dirt in your food. I love the cleanliness of all Disney Parks. A number of things from DisneyWorld in Florida have made it to the re-imagined Disneyland & California Adventure in California. One of the additions is Soarin' ~ a transfer from The EPCOT Center. Another enhanced movie experience is the Bug's Life Theater … a smelling, feeling, live/filmed mix show. The redone Matterhorn Bobsled rollercoaster is a very scaled down version of Expedition Everest from Disney's Animal Kingdom in Florida. This is a fun coaster and even though the line may seem very long, it moves reasonably quickly. The Twilight Zone Tower Of Terror at Disney's Hollywood Studios in Florida also makes it to Disney's California Adventure - although, there, it's called the Hollywood Tower Of Terror. It requires a good stomach. It's essentially a free fall drop-ride. If you like "It's A Small World" - this is there too. It was interesting to see the "Christmas Version" with Christmas songs instead of the normal theme. I highly recommend catching the "Padawan Training" near Tomorrowland. I promise you won't be disappointed, especially if you have kids. This is certainly in my top 5 things in the Disney parks in California. The Indiana Jones Adventure Ride is a must as it's one of the completely unique things to Disneyland in California. I would recommend seeing it later in the day - lines seemed to be shorter. I've always enjoyed The Pirates Of The Caribbean … the ride has been updated to add the movie themes of Jack Sparrow and Davey Jones. It's still really good and surprisingly scary. It seemed like it was just me … but I really loved the night time techno-rave party where an entire street in Disney California Adventure becomes electrified for a TRON party called ElecTRONica! Very unique experience in my mind! In Disney's California Adventure, don't miss the Toy Story Mania! shooting ride or Buzz Light Year's Astroblasters in Disneyland. This is some of the most fun playing carnival games I've ever had! Very fun to compete for your scores! Grizzly River Run is a very, very good twist on the "giant tube rafting" from other parks like Six Flags. I thought the ride was terrific! Most everything else from The Magic Kingdom in Florida is in Disneyland California. So you should be pretty happy in that regard. I know I might get critiqued for saying it that way, but I'm from the East Coast of The United States - most of "us" have never been to the original Disneyland. 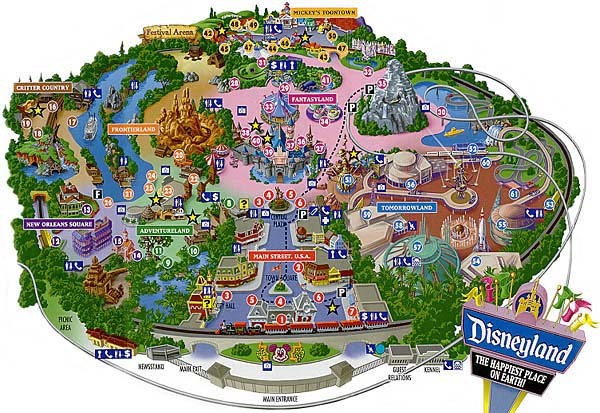 It's also an experience to see how much smaller scale Disneyland in California is vs the DisneyWorld in Florida. I'm always disappointed in the inconsiderate among us. Despite multiple warnings from recordings, from Disney crew, from signs, from shouts from disgruntled people sharing the ride … people still take flash photography. It bothers me to no end. No matter how hard I try to hold it in … it just will ruin an experience for me. The Star Wars Star Tours 3D Motion Simulator ride has recently been redone. This is a near identical experience to the ride in Florida at Disney's Hollywood Studios. I'm not really a fan of motion simulator rides … they make me sick ~ but so do most 3D movies. If 3D movies make your eyeballs hurt or if they give you the least amount of a headache, I recommend you avoid this attraction. While Space Mountain is still very fun … it's no where NEAR the experience of the counterpart in Florida. You will like it if you like Space Mountain, but you'll know what I mean in this review if you've been to both parks. A lot of things have been removed from Disneyland in California (but are still mostly intact in Florida) as a sign of the times I guess. • Carousel of Progress - this was Walt Disney's favorite attraction and the thing that Walt showed off to investors. I'm a big fan of the The Little Mermaid, I think Disney cops out with most of Ariel's Undersea Adventure ride in the California Adventure. 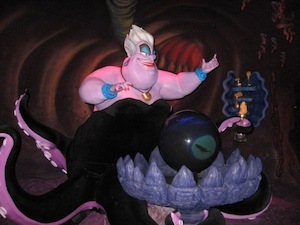 The only plus … seeing a life-size, life-like ~ fully articulating Ursula, the seawitch. The ride itself seems like they ran over budget and so they resulted to cheap props rather than the standard Disney "magical, hidden technology". Not to sound insensitive, but thanks to Michael Jackson's death …Disney has brought back the 3D musical film called Captain Eo. I LOVED THIS! However, most kids today don't get Michael Jackson. To hear the "I wanna leave mommy!" during the show from children and the "I hated that!" from younger adults afterward made me sad. In Tomorrowland - Disney has gone way off focus - it's no longer a vision of the future - it's some wierd mix of things … and Space Mountain. I was very disappointed in how TomorrowLand has turned into "What-The-Heck-Is-This Place-Land". I honestly had to keep looking at the map to see where we were. Why doesn't Disney do anything with The Chronicles Of Narnia? Food at Disneyland in California is high ~ very high. They're aren't nearly as many (if any at all) affordable options to eat, as there are in the Disney Parks; in Florida. Be prepared for a considerable amount of money for eating expenses ... $15 per person / per meal. There is a Subway and a number of fast food restaurants just outside the park, and it's not as big of a deal as it may sound; to leave. 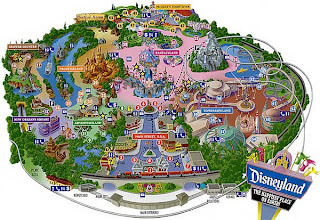 Disneyland California has a city around it, whereas, Disney in Florida is largely self contained. It won't take much time at all to go outside the park and walk across the street. All in all, I really enjoyed my trip. Our family spent the last day wandering around Los Angeles seeing the Hollywood sign, looking at stars on Hollywood Boulevard, visiting Beverly Hills, and visiting the Pacific Ocean via Santa Monica Beach. Since I had just been to the beach in my home state of South Carolina - I enjoyed dipping my toes into the Pacific Ocean and touching two coasts within a month. If you would like a great recommendation to cruise in to eat and you like sushi ~ I highly recommend going to Katsu-ya Sushi. It's singlehandedly the best place I've ever eaten sushi ~ EVER! Great prices for what you get too! Don't let the location surprise you - it's in the same strip mall as RUSTY's Pet Food & Supply Store! [UPDATE] Cars Land is now open in the California Adventure @ Disney and it's receiving great reviews. Seems like a good addition. I was only able to see a few props and of course the construction while I was there. I'd say with this addition, California Adventure definitely merits one day all by itself. One of the biggest additions was a moderately priced restaurant - something all of Disney California is sorely lacking.